breeding healthy Maltese and the quality that AKC recognizes. Established 2001 - Owner, Kristy Humphries began breeding Maltese for the love of the breed. 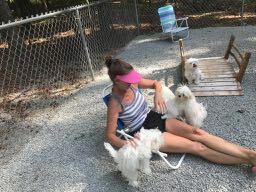 Most of our line was purchased directly from Nell Boykin, retired owner of Bluefield's Kennel in Wilson, NC - Nell bred Maltese for over 20 years therefore, reaching the ultimate goal of breeding healthy Maltese puppies and the quality that AKC recognizes. This Bluefield line now has a 35 year health history. We consciously provide careful breeding and aim for the highset of standards. Our Maltese have individual dog-runs and doggy doors that allow them to go in or out freely for air or to potty. They can choose to stay inside where it's heated/air conditioned or sit outside in the fresh air. We begin weaning our puppies when they appear ready and they gradually start snacking on what the mom is eating which is a special formula by Royal Canin called Mother/Baby Dog Starter. This kibble is designed for mom and baby dog so the pup is getting the correct nutrients when he/she starts to wean. I don't rush this stage and some wean quicker than others but I keep mother with them until we feel all pups are comfortably eating. Our puppies have their own little doggy door to go in and out of and begin potty training as early as 5 weeks of age. I designate a potty pad around 4 to 5 weeks which keeps them from going potty in their bed. This gives them at least 5 to 6 weeks of training before going to their new homes. This does not mean they are potty trained however, with my efforts I hope this puts them one step closer to quickly being potty trained when they go to their new home. Our Maltese are American Kennel Club Registered and our goal is to breed healthy beautiful puppies that meet AKC Maltese standards. Our adult Maltese are regularly veterinarian checked with our local animal hospital. The puppies typically range in weight, as an adult, between 4 and 7 lbs. All puppies are are sold with a limited registration. Appointments are welcome and suggested! Please call or email to schedule a time to visit our home. Puppies are sold in the order that deposits are received and go to their new homes by 12 weeks of age. Breeding Adults are Veterinary examined!